After adding Thailand and Singapore to my World Karaoke Tour, I aimed to make Cambodia the 38th country in which I’ve done karaoke. 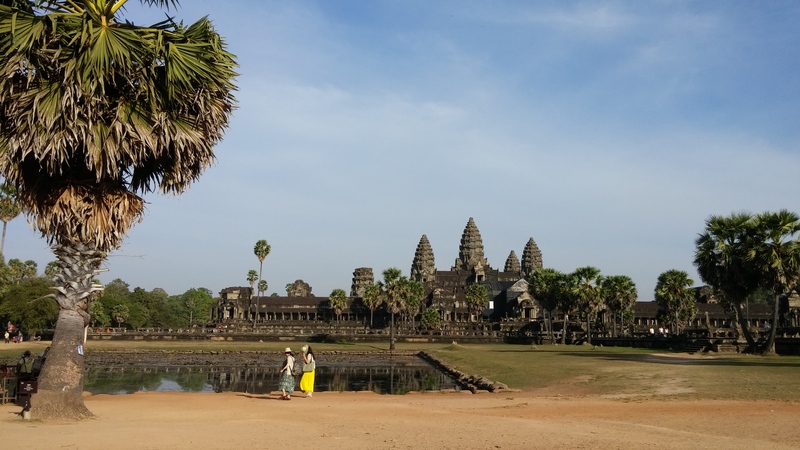 What had motivated me to go to Cambodia — and specifically, to the city of Siem Reap — was the chance to see a bucket list attraction, the Angkor Wat Temple. Things didn’t quite go according to plan. 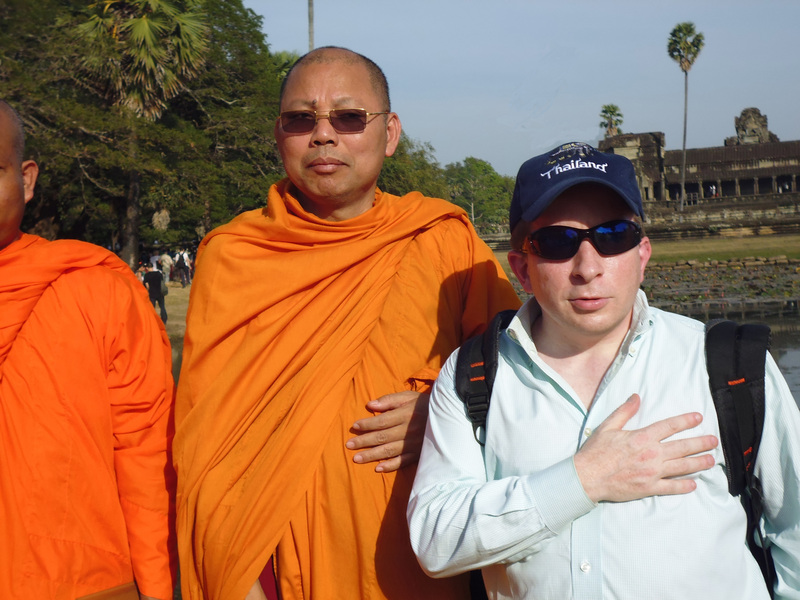 By the time I left Siem Reap, I had failed to sing karaoke; and although I made it to Angkor Wat, that temple has not been crossed off my bucket list, for reasons that I’ll explain. 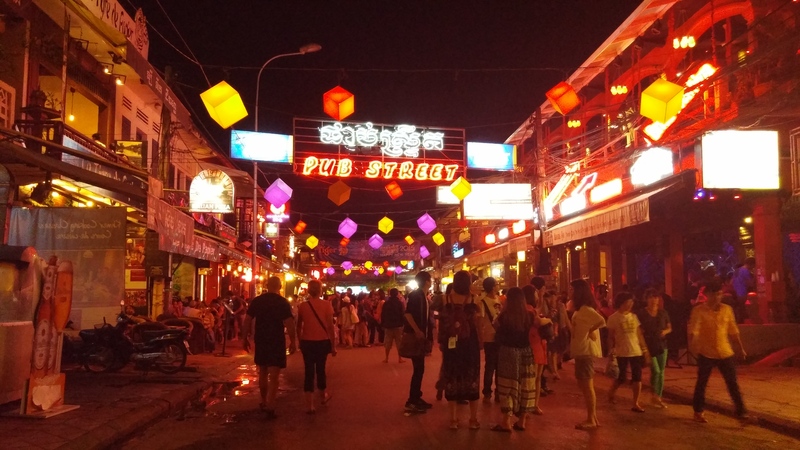 The main nightlife thoroughfare in downtown Siem Reap is Pub Street. 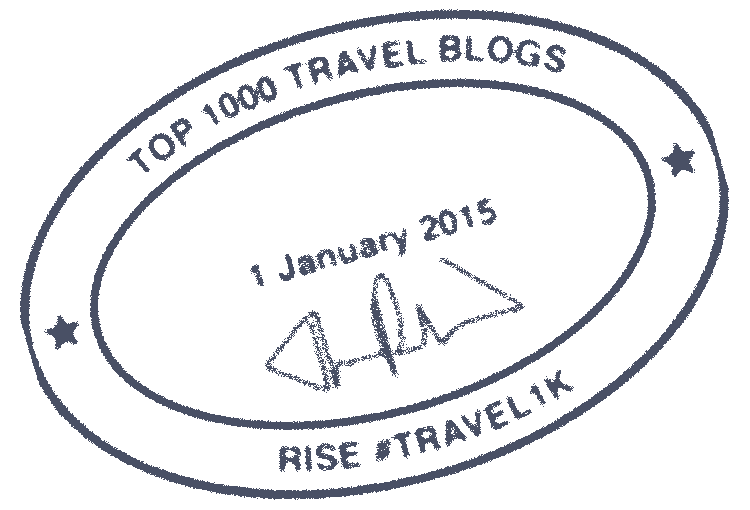 As its name implies, that avenue is lined with pubs, as well as restaurants. The area also abounds with vendors hawking street food. And one end of Pub Street intersects with the night market, a strip of stores that offer a wide variety of souvenirs. Pub Street in Siem Reap. 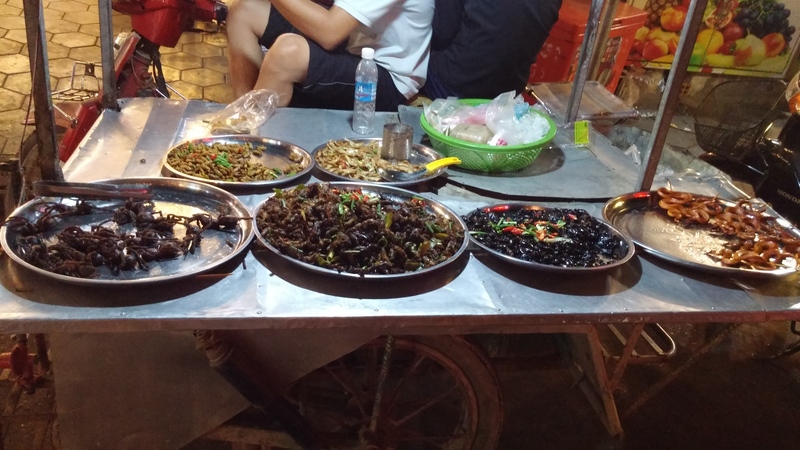 Perhaps the most unusual street food peddlers (compared to what I’d encountered in prior travels) operated a cart whose culinary offerings included tarantulas and fried snakes. I passed up the opportunity to consume such extreme victuals. My lack of adventurousness in this context may have been slightly surprising, given that a little over one year earlier I had dined on a scorpion and worms at the Explorers Club (EC) right in my home city of New York. However, in that earlier instance, the creepy-crawlies that I consumed had been prepared under the expert guidance of the EC’s long-time specialist in preparing that class of food items. (The EC has honoured that chef by bestowing upon him the title of its “Exotics Chairman”; but I digress.) I guess that when it comes to gustatory bravery while on the road, I’m no Andrew Zimmern. I passed up the chance to patronize this cart on Pub Street whose offerings included tarantulas on the left and fried snakes on the right. One thing that I didn’t find on Pub Street, or anywhere else in Siem Reap, is karaoke. Well, not the kind that I seek out: the type where I would be singing in public (preferably on a stage) in front of an audience. I managed to locate two large establishments in town that offer private rooms for karaoke (private room karaoke, also known as karaoke box, is overwhelmingly the most popular form of karaoke in much of eastern Asia); but as I’ve written many times, I look forward to performing — not just singing — and trying to win over a room full of strangers. That opportunity couldn’t be found in Siem Reap. And since I was travelling independently as usual, I wasn’t going to pay to sing in a private room by myself. 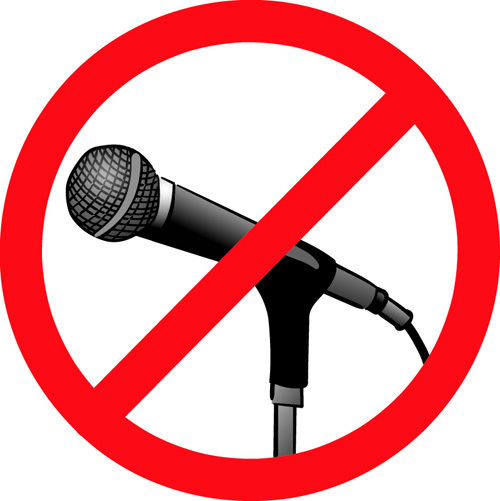 End result: I was shut out karaoke-wise in Cambodia. My next attempt at country no. 38 on my World Karaoke Tour would come a few days later in Seoul, South Korea. Angkor Wat: It looked great on the outside . . . I suspect it’s not very common for a traveller to venture to an attraction on his bucket list, only for it to remain on his list even after the conclusion of his visit. But such is the case for me with Angkor Wat. 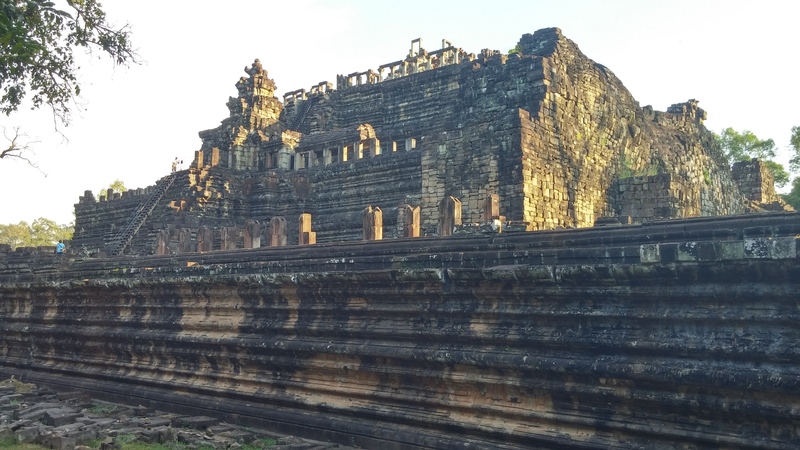 My itinerary in Siem Reap provided me with two full days for exploring the archaeological treasures of Angkor. 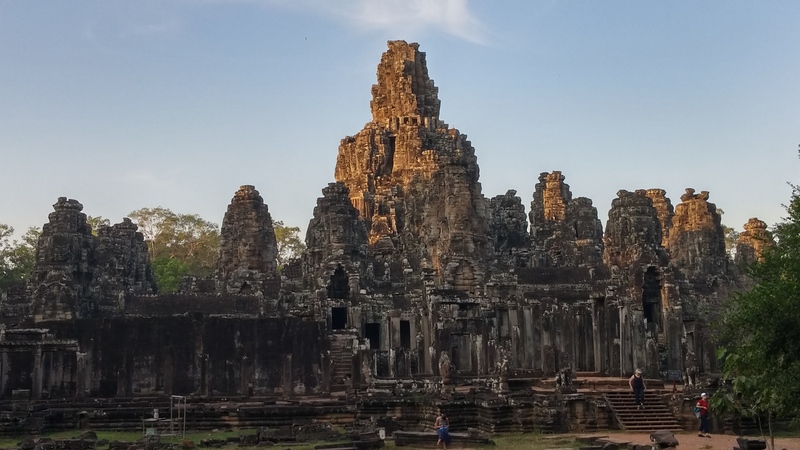 The first of those days I allocated to visiting Angkor Wat, while the second I planned to devote to Ta Prohm — the temple complex that has trees growing through its ruins — as well as a temple called Angkor Thom. After my tuk-tuk driver dropped me off at Angkor Wat, I snapped numerous photos of the main temple, including the image immediately below, as well as this one. Looking across the lake towards the Angkor Wat temple. 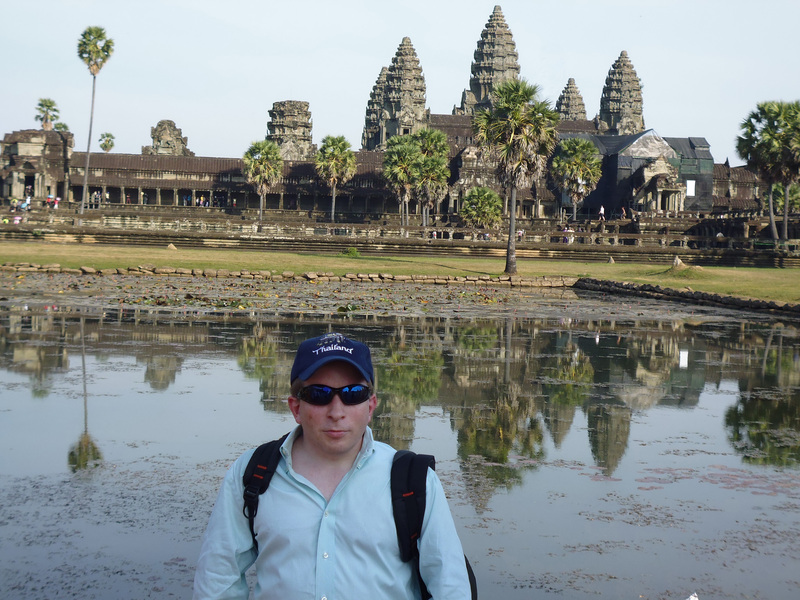 One of the less successful photos of me in front of Angkor Wat that was taken by a total stranger. The sunset that I experienced wasn’t worth foregoing a tour of Angkor Wat. I would have liked to be taken through the Angkor Wat temple by a guide, to have some of its notable details pointed out to me, and to have immersed myself in its history in a way that isn’t possible just by reading about the place. The main edifice at Angkor Thom. Towards the left, there’s a very steep staircase to the top of the structure, which I (with my acrophobia) wasn’t brave enough to climb. 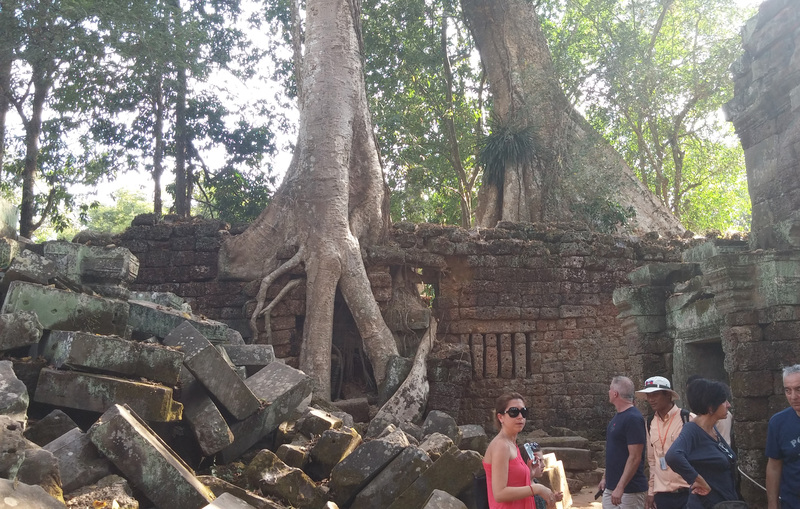 At the Ta Prohm temple complex, this is one of the many areas where nature has broken through the man-made construction. The Bayon temple in Angkor. Okay, I didn’t actually tour this one; my tuk-tuk driver merely stopped on the way back to my hotel to allow me to photograph it. But as had been the case the day before, I got a late start on my day’s wanderings after nursing my injured rib. 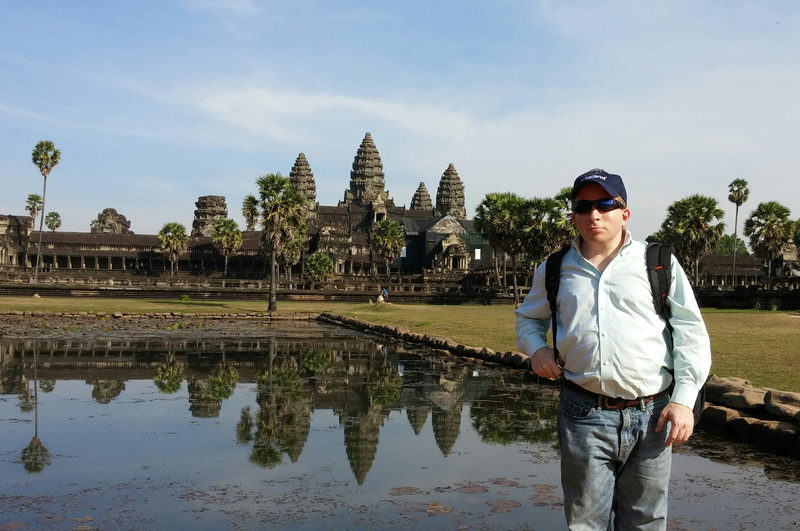 That left me with no time to return to Angkor Wat for a tour. And the next morning I had to go to the airport for my prearranged itinerary to fly to Singapore by way of Bangkok. So I was all out of opportunities to see the interior of Angkor Wat. Would you like to visit the ruins at Angkor? If so, have the adventures of Lara Croft influenced your desire? Too bad you weren’t able to find an appropriate karaoke venue. Based on your report, a well chosen song could have been “Spiders and Snakes” by Jim Stafford. @Michael: I’m familiar with that song, and I thought of it while writing this post. If I ever do get the chance to sing in Cambodia, I would definitely give some consideration to choosing that song!